Munchie's Mind | This is what happens when I play in my kitchen. I’ve been meaning to share this with you forEVER, but kept forgetting to take pictures when I’d make it. I finally remembered, so here it is! I’m not the biggest cake person, but I love a good coffee cake! The Jewel (haha! If you’re from Chicago, it’s The Jewel, not Jewel) makes some great coffee cakes, and to this day I get one every time I’m back home. This is one of my favorite cakes – and one that I think you’ll like too. My sweet friend Becky, who we call Queen Mum, brought this to me after surgery several years ago. One taste and I was hooked! She was nice enough to share the recipe with me, and I’ve made it many times over the years. It’s really very easy, which is hard to believe after you taste it. This is a delicious peach coffee cake with pecans (such a great combination!) and a not-so-crumby topping that makes it even better. You can wait for this to cool before serving (well, maybe you can) or you can serve it while it’s still a bit warm. All I can say about this is: You’ve got to try it! Preheat oven to 350. Grease and flour a 9 x 13” pan or 2 9 x 9” pans. In large bowl, combine cake mix, eggs, lemon extract, pie filling and ½ cup pecans. Beat on medium speed for 2 minutes. The peaches will be chunky, so don’t worry about smooshing them all the way. Combine sugar, flour, oats, cinnamon, nutmeg and remaining nuts. Cut in butter to form crumb topping. Drop pieces evenly on top of cake. NOTE: Neither the Queen Mum nor I have had the topping turn out as a “crumb” topping. Don’t worry about it – it tastes wonderful! Bake 40-45 minutes. Let cool, and enjoy! MUFFINS: This recipe makes great muffins! Use the foil muffin liners, not the paper muffin liners as this is a very moist cake and it will soak through the paper liners. Well, fall finally showed up in Kansas City and with it, all the excitement about pumpkin. And while I’m not a pumpkin fan, I adore the warm spices that are associated with pumpkin – cinnamon, nutmeg, ginger, cloves! One of the pumpkin-obsessed people in my life is a co-worker with an October birthday. Shortly after I discovered he loves pumpkin, I told him I’d make him a pumpkin cheesecake. I don’t care for it, but I hear it’s killer and he believed me. 😉 So October rolled around and as promised, this appeared at the office. Fortunately, it lived up to my bragging and he was happy. He kindly shared it with the team, then took the rest home for himself. My biggest tip: Be sure to wrap your pan in foil. I did, but because I don’t follow my own directions (big surprise, huh?) I used too much butter and my pan leaked. A lot. Up and over the foil, onto the bottom of the oven. Burned butter isn’t the best smell, but even worse is the sound of all the smoke detectors on our main floor going off. My son had to take the dogs outside because the noise was piercing! If you love pumpkin pie – or pumpkin anything, really – and cheesecake, you have to give this a try. I’m told you’ll love it! If you need a good cheesecake book, I highly recommend The Joy of Cheesecake by Dana Bovbjerg & Jeremy Iggers. It was my go-to cheesecake book when I was baking at the restaurants and it’s still my go-to cheesecake book. Mix all ingredients and press into bottom of 10” springform pan. Press crumb mixture to even thickness. Set aside. In large mixing bowl, beat cream cheese and sugar until smooth. Add the eggs and mix, then add the egg yolks and mix just until combined. Add the flour and spices. Using a low setting, beat in the cream and vanilla then add the mashed pumpkin. Beat at medium speed until just mixed thoroughly. Your bowl will be full and the batter will be fairly thin. Pour the mixture into the prepared crust and bake for 15 minutes. Reduce the oven temperature to 275 degrees and bake for an additional hour. The cheesecake should be mostly set but a little jiggly in the center. Turn off the heat. Remove the cheesecake from the oven and run a wet knife around the edge of the pan to loosen the cake. Return the cheesecake to the oven for a couple hours to cool. Before serving, warm the maple syrup and brush on the cheesecake. Drop the nuts into the syrup. Serve the cheesecake warm or chilled, with whipped cream – just like you would pumpkin pie! I saw this recipe on someone’s social media and knew I had to try it. I made it for dinner tonight and I’m glad I did. It’s simple and really good! My apologies to the original chef. I tried to trace it back to the original website (maybe Judy’s Kitchen?) but couldn’t find it. My recipe is adapted from the original. I used a lemon and Italian seasoning. I also think orange / Cajun seasoning or lime / New Mexico green chile powder would be great combos so next time I will try one of those! I inadvertently used a salt-free Italian seasoning and didn’t realize it until after we’d eaten. If you’re not salt-free, add a pinch of salt if your seasoning mix doesn’t already include it. My son’s opinion is it needs a bit of heat, so next time I do the Italian version I’ll add a bit of black pepper. 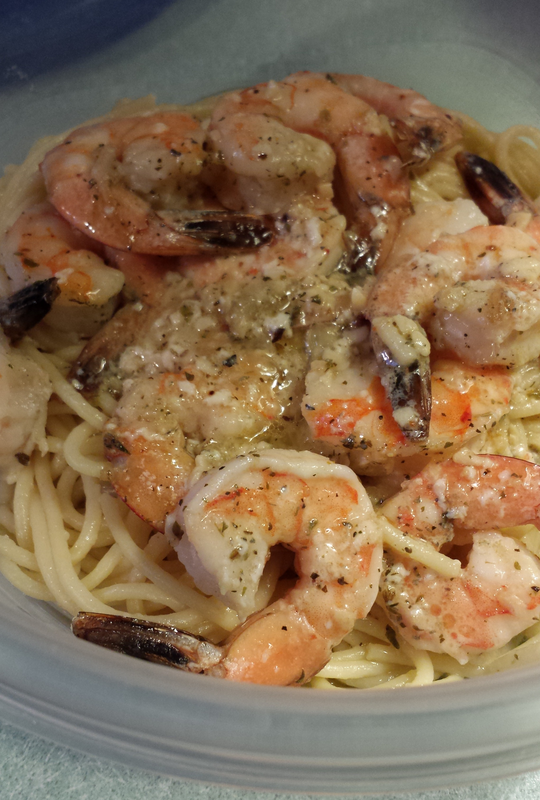 I served the shrimp and butter sauce over spaghetti. The noodles soaked up the butter so we didn’t miss out on any of that flavor! We got two good servings plus leftovers from 1 pound of shrimp. Depending on what else you’re serving, you might get 2-4 portions. This is easy enough for a weeknight dinner, and really quick if you prep the shrimp ahead of time! Line a cookie sheet (with the sides) with foil. Slice the butter into the pan and sprinkle with garlic. Put in oven for about 3 minutes, until the butter is melted. Remove pan from oven and lay the lemon slices in the pan. The lemon slices won’t cover the whole pan, and that’s OK.
Layer the shrimp on top and sprinkle with the Italian seasoning. Remove from oven and serve shrimp and sauce over hot noodles. One of the girls at work says she wants to come back in her next life as my dogs. I do too! They’re spoiled boys but I can’t help myself. They’re cute and sweet and cuddly and all that good stuff. I love them!! I threw away Riley’s store-bought dog treats this weekend because they had some nasty ingredients in them. I bought them because both the dogs like them, but they can’t read labels, so it’s my responsibility to do that. I didn’t like what I read, so out went a nearly full bag of treats. Sorry, pups! With all the warnings about dog treats I’ve been seeing, I decided to make them myself. I’m lazy and didn’t want to bring out the rolling pin / mat (I would have to bend down to get them out of the cabinet) so I searched for the lazy girl’s dog biscuits. Lucky me – I found a recipe, and I even had a banana! This recipe has 5 ingredients, doesn’t require a rolling pin and cookie cutter, and you control everything that goes into them. No nasty chemicals! If your dog doesn’t do well with wheat, use a substitute flour (see the original recipe). My dogs do fine with wheat, so I used normal, all-purpose flour. 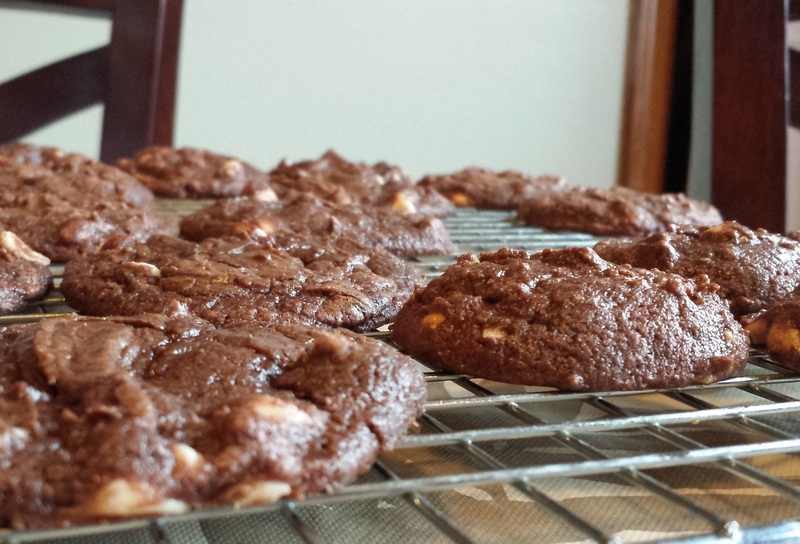 I baked them on 2 cookie sheets because I wasn’t sure if they’d spread. They didn’t, but I don’t know that I could have gotten them all on the same sheet anyway. I’ve got to admit they smelled pretty good when they were baking! Now every time I go into the kitchen, I see all these cookies on the cooking rack. I have to remind myself that even though they are peanut butter and banana cookies, they aren’t for me! Spoil your dogs and make these treats for them. You’ll like how simple they are! Put the banana into a mixing bowl and whip until it’s fairly smooth. Add the egg and whip until incorporated. Drop in the peanut butter 1 Tablespoon at a time. 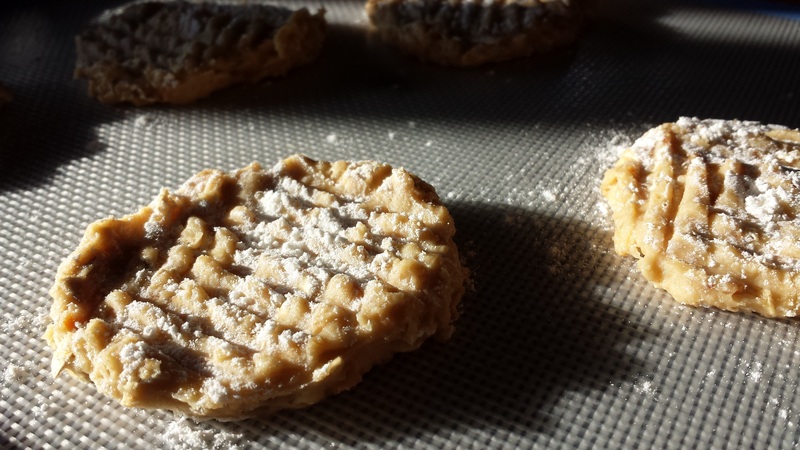 Mix the flour and rolled oats, and add to the mixture. When all ingredients are incorporated, set aside for 5 -10 minutes. 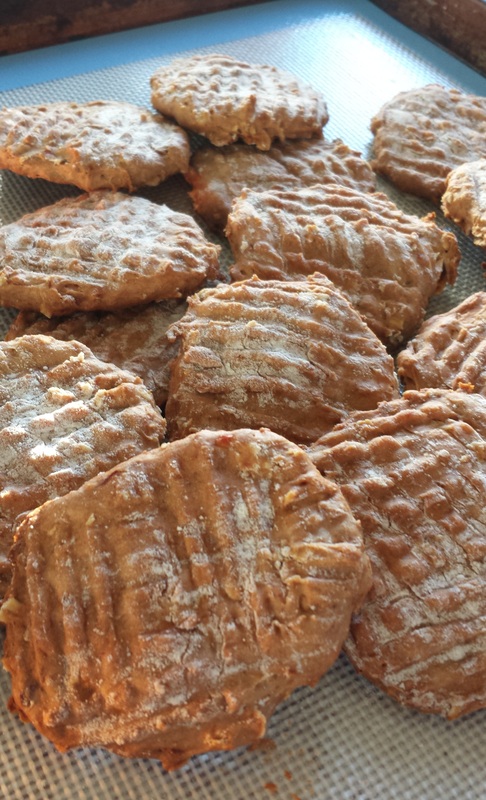 Dip a fork into flour and press down like a peanut butter cookie. Bake at 300 for 40-45 minutes until dry and golden brown on the bottom, switching the cookie sheets halfway through the time. Cool completely. Store in an airtight container in the frig. They can be frozen but should be thawed before serving. My son’s a fan of those boxed skillet meals. I admit to making them more than I should have when he was younger since they were easy and he ate them up. But now that we’re not on the run all the time, I have a little more time on the weekends to cook. If you like spicy food, make it as the recipe says. If you’re feeding children or others who can’t take the heat, use the adjustments in the recipe to tone it down a bit. I wasn’t sure how spicy this would be so I used cheddar instead of pepper jack. Next time I’ll go with the pepper jack cheese. I found some chicken andouille sausage which cut the calories / fat a bit. I wasn’t intentionally trying to be healthier, but it was a nice find. The recipe was a hit with my son and me! 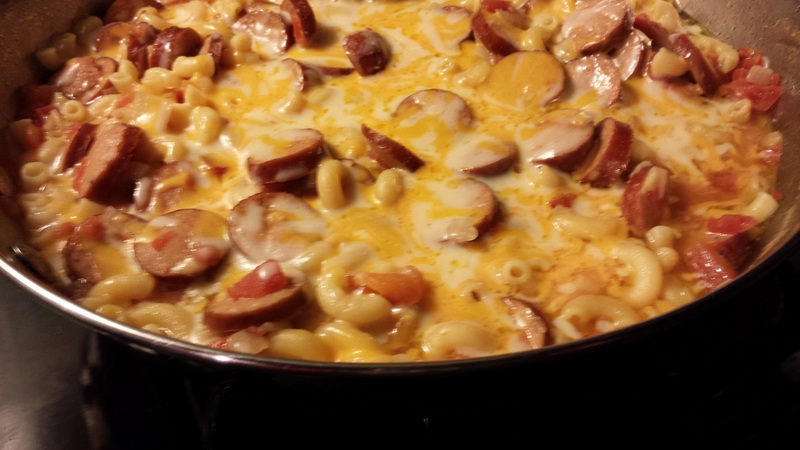 It had great flavor, was cheesy (always a winner in my book! ), and filling. It made enough for the two of us plus some leftovers – which I was happy to take to work for lunch. Quick and easy, you can throw this together on a work night and have a great meal ready in a short time. Give it a try. I think you’ll like it! Stir in chicken broth, tomatoes (undrained), milk and pasta. Season with salt and pepper, to taste. Bring to a boil. Cover, reduce heat and simmer until pasta is cooked through, about 12-14 minutes. I always forget how simple it is to make pesto. Stuff everything into the food processor, turn it on, and presto – Pesto! The hardest part for me is taking the food processor out of the box and fitting it back into the box when I’m done with it. I keep quite a few kitchen toys in their boxes in the garage – the ones I don’t use often enough to justify keeping them in my kitchen, because I don’t have much storage. So far I’m impressed with my skill at pulling out a multi-piece appliance that’s packed in 3 rows of Styrofoam and getting it all back into the box like it was never taken out. I’m good! Haha! The second hardest part is not killing the basil plant. I’ve killed 3 or 4 or 6 – and that includes those that “just need water.” *sigh* Recently I bought a large basil plant for $3.99. I couldn’t pass it up, even though I expect it also to die. I’m trying something different this year. Instead of baking the plant in my western-facing kitchen window, I’ve got it outside my front door to catch the morning sun. So far, so good! So Pesto. What do you do with it? or do what my boss does and put it on your freshly cooked corn on the cob. 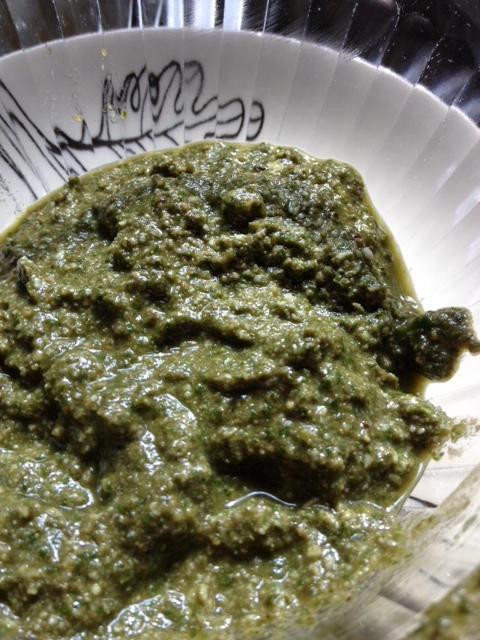 Combine basil, garlic and walnuts in a food processor and pulse until coarsely chopped. Add 1/2 cup oil and process until fully incorporated and smooth. If using immediately, add remaining oil and pulse until smooth. Add the cheese and pulse until just mixed. Thaw and stir in cheese. On the way to making the cider-glazed chicken in the original recipe, I got derailed by some beautiful pork chops in the meat case and had to make the change! This dish has some really great complementary flavors. The cider-glaze is a bit tart if the pork chops were to be eaten by themselves, and the brown-butter rice would be a bit rich/ sweet if eaten alone. However, when the two are combined they come together beautifully and create this interesting flavor profile! I doubled the sauce because I’m a sauce addict and next time would probably make even more. Even with the original quantity of sauce doubled, there really wasn’t much. I wanted enough to drizzle into my rice. When it comes to sauce, more is better! While rice cooks, melt 1 teaspoon butter in a large heavy skillet over medium-high heat. Sprinkle pork chops with 1/4 teaspoon salt and pepper. 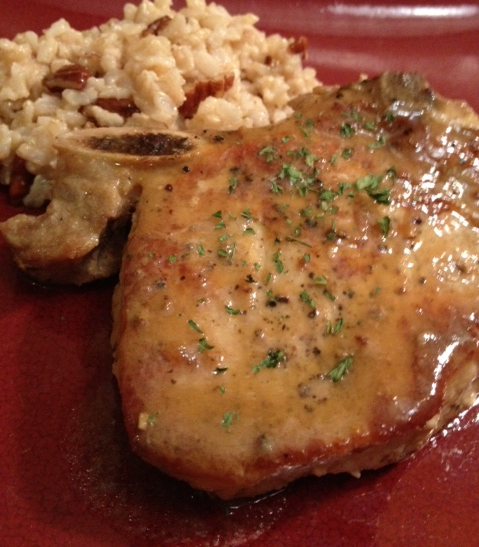 Add pork chops to pan; cook several minutes, depending on how thick your chops are, on each side or until done. Remove from pan. 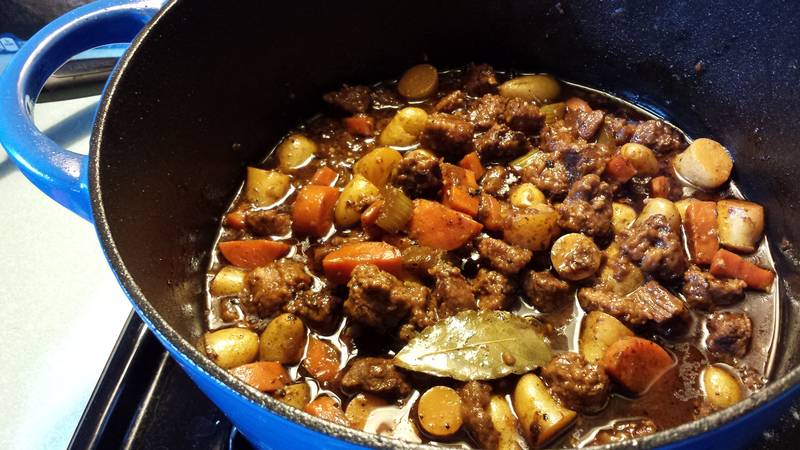 Add cider and mustard to pan, scraping pan to loosen browned bits; cook 2 to 3 minutes or until syrupy. Add pork chops to pan, turning to coat. Remove from heat; set aside. Melt remaining 5 teaspoons butter in saucepan over medium-high heat; cook for 2 minutes or until browned and fragrant. Watch it closely so it doesn’t burn! Lower heat to medium; add pecans, and cook for 1 minute or until toasted, stirring frequently. Add rice and the remaining 1/2 teaspoon salt; toss well to coat. Serve rice with pork chops. Sprinkle with parsley.